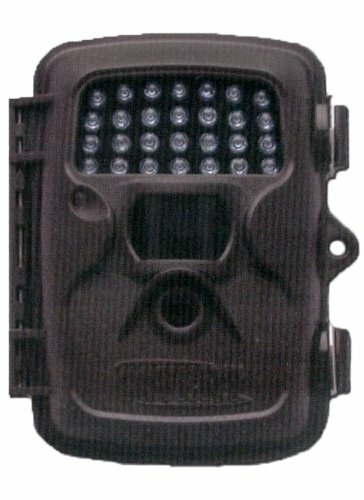 Covert Trail Cameras has a reputation known for its affordability not compromising the delivery of reliable performance. It may not be one of the leading categories, but it is consistently above average in most of the other types. This brand has come out with a wide range of innovative and versatile features which perfectly meet the needs and demands of every user. These Covert Cameras are ideal not only for wildlife but as well for surveillance. Below is the list of the best Covert Trail Cameras which you may add to your collection of wildlife and surveillance devices. With the second biggest wireless provider in the US with more than 14million subscribers, AT&T offers a camera that changed the industry of wireless trail cameras. In connection with the wireless capability, AT&T Covert Code Black Camera allows users to text photos to your smartphones or email address. This process uses an activated SIM card from a GSM (Global System for Mobiles) network to make it all happen. The technology allows the users to check on their cameras’ data anytime without having to go to the camera and pull out the SD card. It gives you awareness of the things that happen on your properties or in the woods while you’re away. Less hassle. This makes the woods and the security available on the user’s fingertips, anytime and anywhere. This model sends pictures to the phone app if the camera is set up to do so and that the mobile service is on. The device provides MMS 3G wireless activity and the instant picture viewing. Aside from that, it also features many other functions such as three adjustable sensitivity levels, time/date/temp, and moon phase stamps, real-time control, weather and wind information, time-lapse, SMS commands, etc. This camera is ideal for hunting and security purposes as well. It operates when powered with 12 AA batteries and could last for long. It supports 32 GB SD card capability that allows you to store a lot of pictures. This camera produces 12 MP pictures and is equipped with 2 inches color viewer screen. It captures images at night through the 60 invisible or no glow flash LEDs. The flash is undetectable, and the range could reach up to 60 plus feet. Fast machine to machine communication. Great product with the easiest retrieval of pictures possible. The device helps to conserve battery life. Cannot send videos to the phone. The seals should have been made better. You have no control over the images that come in. You might encounter AT&T plan confusion and issues. Size does matter especially if you don’t like bringing bulky tools in the woods or anywhere you’d go. Covert MP8 LED MO Black Trail Camera features its perfect little size that will never bring you down. MP8 Black along with its time-lapse and start-stop modes do not disappoint users with its performance. 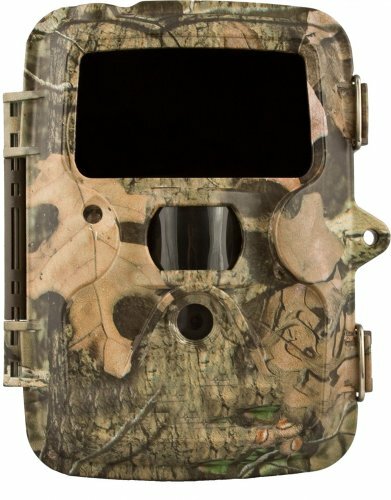 It comes in Mossy Oak Country, and it captures 8MP images in .9 seconds trigger speed. It is capable of 1-10 turbo shot burst that documents every movement in the wild along with its maximum silence image capture feature. It produces colored pictures during the day and clear black and white images at night. It is equipped with 40 no glow high power LED lights, and the flash could reach up to 100 feet. Take advantage of the farther coverage area that the flash could reach. You can also preview your documentation with its 1-inch color viewer screen. The invisible flash technology that the camera features does not scare away the wildlife nor disturb them in their habitat. For security purposes, this camera is likely not noticeable by human beings. The red light that the camera produces is considered to be blacked out which means they do not have the standard red glow of infrared. However, users could use some small items to blend the camera into the background which can also make it more unnoticeable. 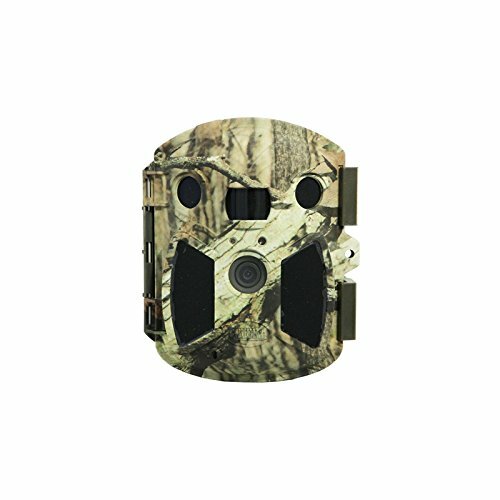 Covert MP8 LED MO Black Trail Camera supports 32 GB SD card and is powered with 8 AA batteries that could last for two months. The camera always does well. The camera might not do the best in a heavy canopy. The pictures are sometimes darker. Also, Covert MPE6 triggers more consistently, and it could be set up on an HME trail camera holder which makes it more flexible in setting up in the field. 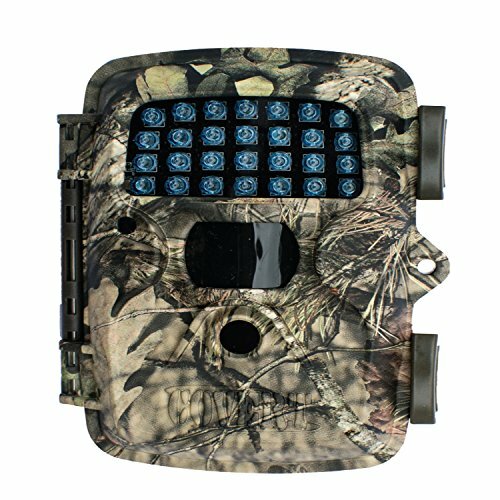 The camera, like any other trail cameras and any other Covert brand cameras, offers essential features such as colored pictures during the day and clear black and white photos at night; time lapse, photo + video, photo modes; time, date, temperature, and moon phase stamp; etc. Other than that, the camera produces crisp and clear images with the photo resolution of 6 MP. It is equipped with 28 red glow LEDs and has the flash range of 45 feet. The camera works when powered with 8 AA batteries, and it supports 16 GB SD card. The device also has a small screen on the inside allowing the user to preview the pictures taken and the recorded videos without having the need the to remove the SD card. The trigger speed is excellent. Might constantly take pictures without anything triggering it. Might capture red or pink tinted photos at daytime. Night pictures are sometimes blurry. 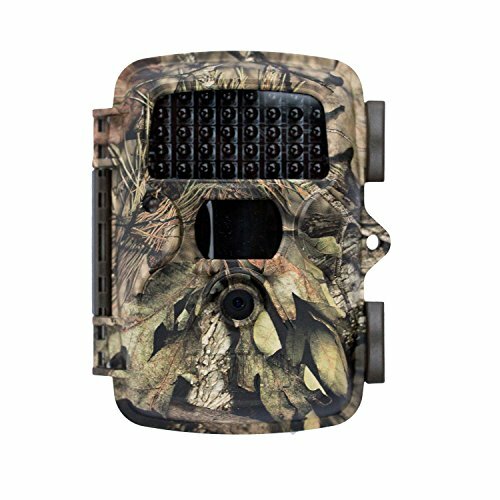 Covert MP8 Trail Camera that comes in Mossy Oak Break-up Country is loaded with most of the features of the Extreme Series. It offers the same essential features like with other trail cameras do such as; photo mode, video mode, photo + video, time-lapse, date, time, temperature, moon phase stamp, start-stop mode, etc. Other than that, it also has its three adjustable sensitivity levels. This camera produces a fantastic postcard quality like images with the photo resolution of 8 MP which is also adjustable from 3 to 5MP photo resolution. You can preview the photos taken (without removing the SD card) on its small, easy to use color viewing screen which is located inside. Get wildlife activities in motion with its capability to records high definition videos with audio. 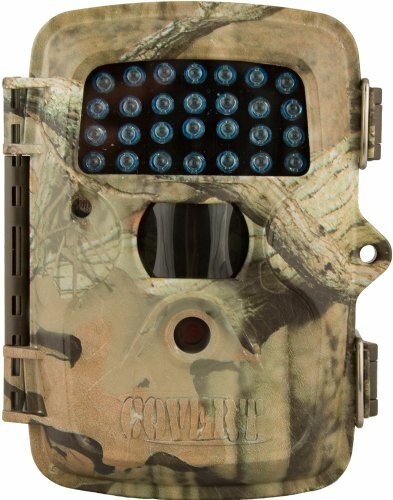 Covert MP8 Trail Camera is equipped with 28 red glow LEDs. This is not the black flash camera, and the LEDs will glow red when taking pictures at night. It requires 8 AA batteries to function at its best. Produces quality pictures and videos. Nighttime photos might be of poor quality. The cam might get leaked around. It will false trip if anything is moving like leaves. It has a narrow focal length lens. Get your wildlife scouting and security even more exciting and efficient with the AT&T Network Ready Code Black 12.1 Wireless Camera. With its new technology, the camera allows the users to text photos to the smartphones or email addresses. Instant picture viewing is possible anytime, anywhere. But you also have the function to preview the documentation on the 2 inches color screen of the device. You don’t need to have your SD card removed to review data nor to have to run to the camera for checking. For the wireless function to work, you need to have an account with Covert Wireless, and it will allow you to even text photos to any cell number with other service providers. Code Black 12.1 can function short term on 4 AA batteries, but you can extend and improve the battery life by supplying the device with 8 AA batteries. But you can also have 12 AA batteries to get the most functionalities out of the camera’s battery life. The most extended battery life could take up to 600 videos with 5 seconds interval and with the length of 10 seconds. It supports any SD card size up to 32GB, and the device won’t turn on and work unless you insert the SD card on it. You can adjust the photo resolution from 3MP, 5MP, 8MP, or 12MP. A photo burst mode is available wherein you can take 1-10 pictures every time the PIR is triggered by heat or motion. Time-lapse, start-stop mode, and timestamp are also possible. Trigger time is adjustable from 1-60 minutes. You can take 5-60 seconds videos, but it won’t be sent your Mobile App. Sensitivity is adjustable under the temperature or working condition the area is on. Additionally, Code Black 12.1 alerts low battery through its LED indicator. Excellent image and video quality. Settings can be managed remotely. The least sensitivity might be still too sensitive. Some advertised features might not work consistently. The application might be unstable. Website and software are outdated and full of encryption/security issues. 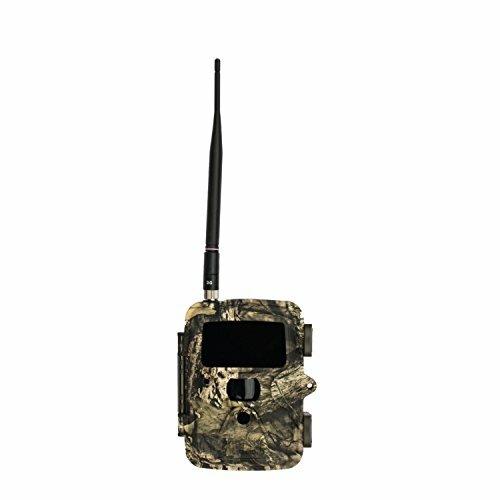 Covert Code Black Verizon Camera that comes in Mossy Oak Break Up Country is also a cellular/wireless trail camera associated with the Verizon mobile service provider or network. It uses an activated SIM card from a Global Service for Mobile or GSM network to enable the device in sending photos through a text to your smartphones/cellular phones or email addresses. Take advantage of its fast machine to machine communication wherein you never need to run to your camera nor to remove SD Cards to check the photos. You can always view your documentation in an instant anywhere, anytime, as long as there is a stable signal. However, the camera is incapable of texting videos to any smartphone. Same with the AT&T Network Ready Code Black Wireless Camera, you need to have an account with Covert Wireless to make use of its wireless functionality. This camera is a motion and heat activated or time-lapse triggered. It allows you to receive real-time information through its Verizon’s approved network. Other than that, you can also have the ability to control your camera and have the weather and wind information on a real-time basis. For product specifications, Covert Black Verizon Camera takes 12 MP photo resolution images. Colored pictures during the day are produced and clear and black images during the night. It is equipped with 60 invisible flash LEDs that are undetectable and have a flash range of 60 plus feet. You can also review the photos and videos directly on its 2-inch color screen viewer. The modes sensitivity can be adjusted to 3 levels that are according to the users’ preferences. You can have the time lapse mode on and the time, date, temperature, and moon phase stamp on too. Also, the camera features its 3G Wireless activities and SMS commands. 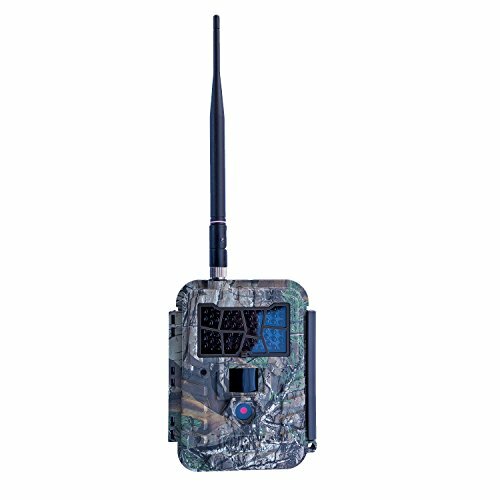 It is powered with up to 12 AA batteries and could be used not only for scouting but security purposes as well. Supports 32 GB SD card. Data rates might be very high. Can’t text videos to a smartphone. Less the wireless feature, Covert Scouting Camera Extreme Black 60 has all of the same attributes with Code Black. By popular demand, what’s new about this camera is the addition of HD Video along with sound capabilities as well as a new Two-Phase Timer switch and the increased SD Card capacity to 32GB. Black 60 is equipped with 1.2-second trigger speed with the intervals set from 1sec to 60 min. It is guaranteed never to miss a thing that passes by. You can take and choose from 3 MP, 5MP, 8MP, and 12 MP for photo resolutions and take high definition videos with audio. With its photo burst feature that includes 1-3 pictures per trigger, you will have even more pictures and will surely take every important motion in the wild. You can view the images and videos on its built-in color viewer screen. This is the best camera not only for hunting but also for security and surveillance. It has 40 Red Glow LEDs, and the nighttime flash range of 65 feet produces clear black and white pictures at night. Other than that, you can have the option to turn on the time, date, temperature, and moon phase stamp as an info strip on your pictures and videos. Black 60 is password protected that prevents an unauthorized person from seeing the data on the camera. It works if power supplied with 12 AA batteries that could take up to approximately 3000 pictures. Lastly, the camera features its Overwrite Selection which when selected, the new photos overwrites the oldest photo on the SD card after the card is filled. Daylight color photos are excellent. All of the hardware is solid. The big red dimly lit-up rectangle is going to catch eyes. The camera also makes audible clicks now and then. Night shots are a bit grainy. The camera is made with a durable, all-weather plastic body and can surely work on any weather conditions. It is equipped with 28 Red Glow LEDs and has the flash range of 45 feet. You can capture images with the photo resolution of 6 MP and record videos up to 20 seconds. It provides outstanding daytime and black and white pictures at night with depth and clarity. With its fast trigger speed of 1.2 seconds, it is guaranteed that you can document the breathtaking wildlife activities. The most excellent feature of this camera is its battery life. It is powered with 8 AA batteries and could last for long. It can take up to 3000 pictures with the 8 AA batteries supplied. Other functions and modes offered by this camera are the time-lapse and the date, military time, temperature, and moon phase stamp. Covert Scouting Camera MP-E5 might not have that new techy and many features, but it’s great on battery life and “does the job.” This camera can be ideal for hunting or security purposes. The flash is not visible. Can work in rough weather for very long periods. Maybe a little overly sensitive. Rain might get inside the device. 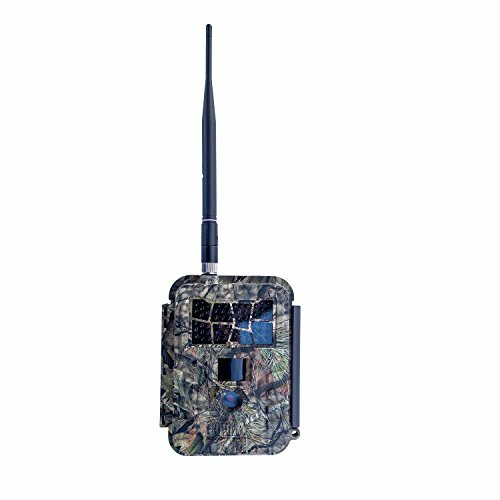 Packed with most of the same features of the Extreme Series, Covert Scouting Camera MP6 is perfectly fit for those who are on a budget. With its ability to capture crisp and clear 3-6MP photos, your hunting documentation would be satisfying and great. During the day, pictures taken will be brightly colored but are black and white during the night. Pictures at night are illuminated by the 28 Red Glow LEDs. And with its 1.2 seconds trigger speed, you can ensure the detailed documentation on the wildlife activities. 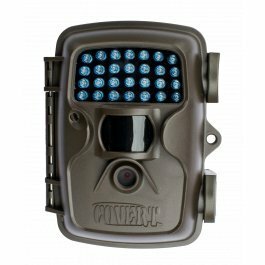 Covert Scouting Camera MP6 is equipped with built-in color viewer where you can check and preview the pictures and videos you have taken. The camera should be supplied with power from 8 AA batteries for it to operate and function at its best. The 8 AA batteries could take approximately 3000 pictures all in all. It supports 16 SD card, and it offers features and functions you can also find in any other covert cameras. The features and function include the modes wherein you can select from the time-lapse and start-stop mode. You also have the option to allow date, temperature, time, and moon phase stamped on your pictures. The camera offers video capabilities, and the sensitivity is adjustable to 3 levels. Other than that, what makes you choose to choose this camera is it’s because the Covert Sporting Camera voted this as “2012 Best Buy” which is from INSIDE ARCHERY. Compact and easy to configure. The night-time and daytime pictures are good. Very versatile and easy to hide. The red light is very bright capturing at night. Latches don’t hold up; they leak water to the inside. Night time pics are so dim. Get your issues resolved with the Covert’s wide-angled camera – the Outlook. The Outlook is equipped with a wide angled camera that has 130 degrees of view. It, therefore, resolves the common issues of the users in which they are not getting everything in one shot. The camera offers wide coverage of the area to be documented. Aside from this highlight, this camera also provides many other features and functions as what other cameras would have. The camera includes 1-second flat trigger speed in its features. It can take images with 12 MP photo resolution as well as high definition videos with super sound. It also highlights its 3 inches display screen where you can preview and manage your documented wildlife activities. Other than that, it also has time lapse and start-stop modes. Photo stamp is also available wherein you can choose which information you would like to be stamped – may it be the date, time, moon phase, and temperature. The Outlook supports 32 SD Card capability, and it operates on 4, 8 or 12 AA batteries. Programming this camera is easy since everything is clearly labeled. You can protect your camera and the data in it from other people by setting the password for security purposes. 130 degrees field of view. The wide field of view is good for area monitoring. The pictures, video, and the sound are excellent. The video must be converted to be viewed on a Mac.